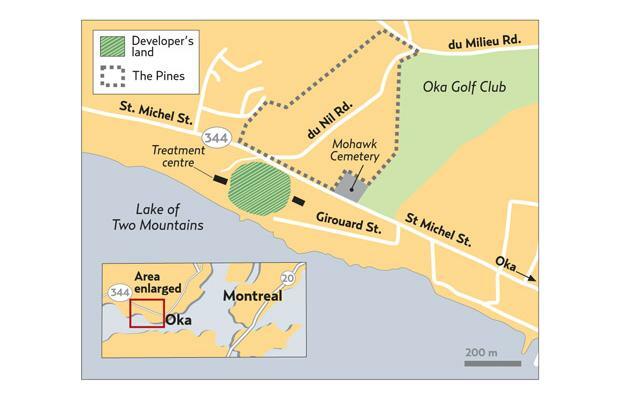 Is Oka round 2 about to erupt? With all of the headway CANACE has been making in bringing an end to race based policing in Ontario, I was somewhat surprised to learn today that the signs of another illegal occupation are beginning to surface. This time it’s not small town Ontario, but in Oka Quebec where the Canadian military had to be called in to quell Mohawk Warriors (a terrorist organization) in 1990. The Oka crisis had many familiar hallmarks of Caledonia. An illegal occupation to prevent development on private land, a lack of action by the local police until it was too late, a riot, the blockade of a prominent highway, and a government that wanted to keep its hands clean of the situation. The primary differences are that the Mohawk warriors murdered a police officer with a gunshot to the face, and the military was subsequently brought in to quell the riot. Extensive history of Oka can be found online so long as one is able to weed through the pro criminal propaganda. The issue in 1990 was the expansion of a golf course, and today it’s development of land right across the street. Thus far media coverage is somewhat limited, but we’re hopeful that many more details will come out soon. Here’s what we know so far. At the end of the 1990 crisis, the Federal government bought land owned by non-natives in the area and handed it over to the Mohawks. A band aid solution to a huge problem and an act of appeasement in my view. This settled down the Mohawks long enough to ensure that a different government would be in place the next time they acted up. 20 years later, the same land claim tactic is being used by the same group and Ottawa says it’s not buying any land to hand over to anyone. I say good for them, but don’t dump the fallout on a hapless developer. 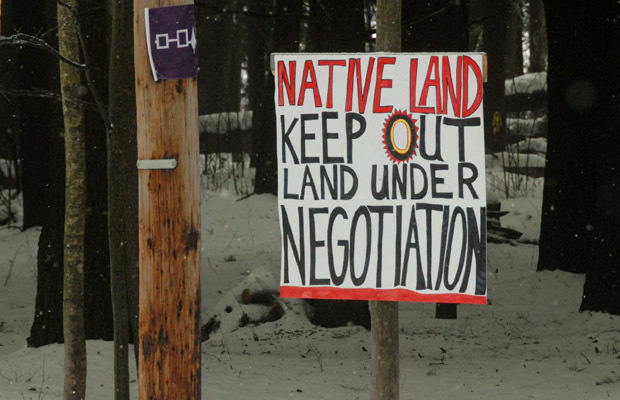 The Kanesatake band council has sent a letter to the land’s owner demanding that he not develop the land or clear the pine trees until Mohawk grievances are resolved. This may sound innocuous to some, but any builder knowing the history of the area (and you can be sure he does) would be getting very uncomfortable right now. “Canada does not expropriate or buy land to settle specific claims,” said Geneviève Guibert from the department of Indian and Northern affairs to the Montreal Gazette. Too bad nobody bothered to tell Dalton McGuinty this in 2006. The Developer maintains that he has a right to build on his private property. Obviously he’s right, but in Canada the rights of non-natives are bulldozed to make way for the whims of Native extremists. CANACE is working as fast as we can to change that policy, but it’s a mission that’s unlikely to be accomplished in time to save this poor guy from what’s coming. On Monday, 3 employees of the builder were confronted by Mohawks when they tried to cut down a few trees that are in danger of falling on a neighboring house. The builder says they will return next week to finish the job. Although the Mohawks say they don’t want any trees cut down, they have themselves chopped down some of the pines in order to build smoke shacks along the highway. How much more hypocritical can you get? It couldn’t be much more obvious that a confrontation is brewing, and nobody is willing to budge. The only good news for all involved is that Julian Fantino has absolutely no jurisdiction in Quebec.